Pepper leaves turning white is an indication of powdery mildew, a common fungal disease that can afflict nearly every kind of plant under the sun. Powdery mildew on pepper plants can be severe during the warm days of summer, and can significantly affect quality and yield at harvest time. What can you do about that nasty white powder on pepper leaves (or sometimes brownish-yellow)? Read on for helpful information. What Causes Powdery Mildew on Pepper Plants? Powdery mildew on pepper plants spreads primarily by wind, but also by splashing water. 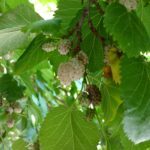 The disease is also transmitted by humans, and sometimes by insects such as aphids, thrips and whiteflies. Certain weather conditions favor the disease, particularly weather fluctuations such as warm, dry days followed by cool, moist nights. Plant crowding is also a contributing factor, as is excessive use of high-nitrogen fertilizer. Mature plants are most susceptible to pepper powdery mildew. 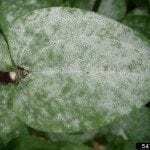 Treating pepper powdery mildew in the garden is certainly possible, although prevention is even better. Monitor plants closely, especially the undersides of leaves. Fungicides may provide some level of control, but only when applied as soon as the disease appears, or even before symptoms are visible. Complete coverage is critical, and repeat applications are usually required. Avoid conditions that promote wet foliage, including shade and overcrowding. Plant peppers in full sunlight and allow plenty of space between plants. Also, keep weeds under control, as weeds can foster disease pathogens. Water at the base of the plant and avoid overhead sprinklers whenever possible. Irrigate early in the day to allow time for the leaves to dry completely before evening. Avoid high-nitrogen fertilizers, which make plants more susceptible to infection. Home remedies for powdery mildew on pepper plants are sometimes employed as well, especially in organic gardens. It is usually recommended to alternate these remedies, however, for them to be most effective. 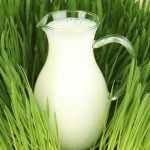 Some research suggests that milk may be as effective as chemical fungicides. Fill your sprayer with a solution of 1 part milk to nine parts water. In some cases, baking soda is effective against powdery mildew, especially when mixed with horticultural oil. Fill a one-gallon sprayer with water, then add a tablespoon of baking soda and 2 ½ tablespoons of horticultural oil. Try a garlic extract consisting of two entire garlic bulbs blended with a few drops of liquid dish soap. Strain the mixture through cheesecloth and store it in the refrigerator. Combine the mixture in a sprayer at a rate of one part garlic extract and ten parts water.